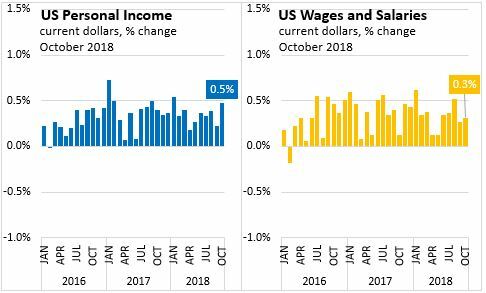 The US Bureau of Economic Analysis reports that US personal income increased $84.9 billion, or 0.5 per cent in October 2018 (seasonally adjusted levels at annualized rates). The increase in personal income in October primarily reflected increases in wages and salaries, proprietors' income, and government social benefits to persons. 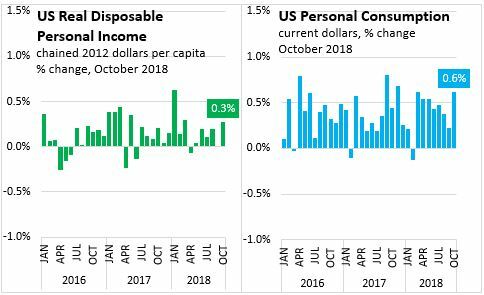 US personal disposable income increased $81.7 billion, or 0.5 per cent in October 2018. In real per capita terms, US disposable personal income increased $121.0 billion (chained (2012) dollars) or 0.3 per cent in October 2018. 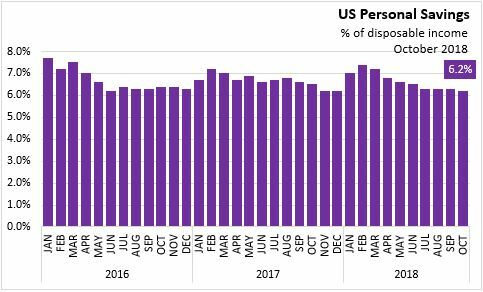 US personal consumption expenditures increased $86.9 billion, or 0.6 per cent in October 2018. Personal savings (disposable personal income minus personal consumer expenditures, interest paid, and transfers to government and the rest of the world) was $967.8 billion in October 2018. The personal savings rate was 6.2 per cent of disposable income.